Shower and windproof with front pockets for storage and a large back pocket that turns into a bum bag to store the jacket. ​Warm and cosy club hoodie, large printed logo on front, printed North Herts Road Runners text on rear with contrast lining. A real winter warmer! - great for keeping out the cold before and after Cross Country races. Padded and water resistant with zipped internal and external pockets and adjustable hood. 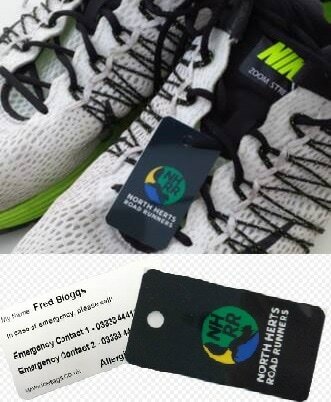 Printed logo on front and North Herts Road Runners text on rear. This T shirt is ideal for before or after racing and training, and can be worn under your club vest for those chilly winter races. Great for club photos and when on the podium!! Important: not to be worn instead of a club vest when racing. Hi visibility for daylight / low light conditions (not reflective, so no good for dark nights). Great for training. Hi visibility for daylight / low light conditions (not reflective, so no good for dark nights). Longer sleeves for extra warmth. Great for training. Mandatory kit for winter / dark evening club training sessions. Great for muddy XC shoes or gym kit. ​The perfect winter hat, this natty knitted beanie will keep you warm after those chilly XC races. Also great for training and warming up - a must have for the winter season! ​Great for keeping the sweat out of your eyes in the summer and your ears warm in the winter! ​Printed with a reflective logo.